The tiny house movement has put a different perspective on owning homes — it’s quite incredible what can be done, living a minimalist life in a storage container. In fact, many people are opting out of owning large properties with sprawling gardens, a cottage with bay windows, large rooms, and storage space. Instead, they fulfill the dream of living a life that doesn’t tie them down to the comforts of their home while traveling around. Now, they can have the best of both worlds—a storage container converted into a cozy home with wheels that allows them to move around without leaving their home. How much more comfortable can you get! These storage containers can accommodate small families, so they aren’t limited to singles or couples. It’s all about how the fixtures are fitted inside, making the best use of the space available. 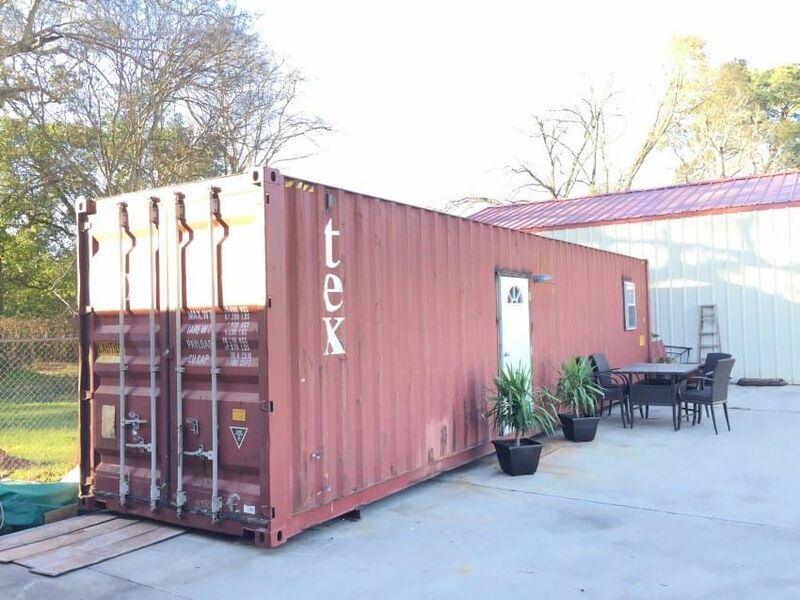 This red storage container looks ordinary from the outside, but wait until you get a peek inside. What catches the attention, first of all, is the neat patio with potted plants, a seating arrangement, and a white door. At night, the exterior looks even more ordinary. However, the interior tells quite a different story. Wooden floors, tall ceilings, and an open floor plan give it the most extraordinary look. Even the walls are paneled with light wood. 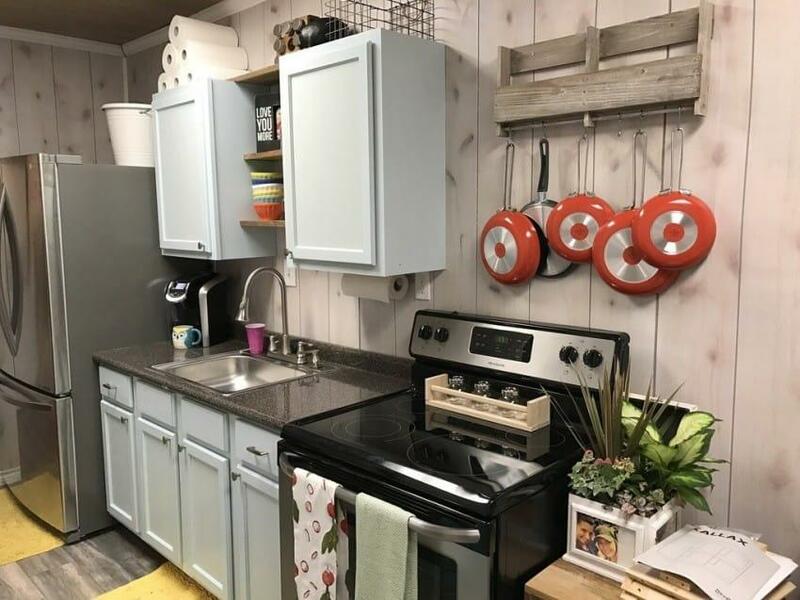 The storage container has been transformed to fit in a good-sized kitchen, a comfortable living room, and a quaint little bedroom. The kitchen is a neat amalgam of a full-sized oven, a fridge, spacious counter space, and cabinets for containers. The kitchen cabinets are a sky blue paint to give the space a bright and airy feel. The bright yellow rugs add warmth and a dash of color to the interior. There is a clear line of sight from the kitchen to the bedroom. The ceiling lights more than make up for the absence of windows by creating a skylight look that lights up the space inside. The bedroom is nice and cozy with enough space for two people. The space is made to look larger with the hanging lamps and mirrors. The shelves on the top of the bed are used for keeping books or cell phones or any other thing that would normally be put away on a bedside table. The bathroom is fitted with a toilet, shower, washer, and dryer and is hidden behind a sliding barn door. This is an example of how well small spaces can be utilized. What do you think of the concept of tiny homes? Share your thoughts with us in the Comments section below. Don’t forget to check out 14 Unbelievably Low-Cost Ways to Give Your Home a Brand-New Look.